Jim D. has suggested I welcome all of you folks good enough to drop by. In case there's any confusion, Jim D. also suggested I post a link to the post Dave referred to on his page. 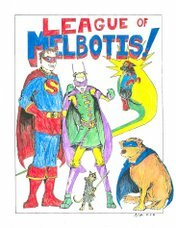 The League of Melbotis is not a comics blog in the strictest sense, but I'm a fairly avid comic reader, and thus, a lot of comic related discussion goes on here. You may note I am a fan of Superman and DC Comics. I also read other comics, too, so don't worry about me drawing some line in the sand over that topic. Feel free to drop in any time, put your feet up and leave some comments. We'd love to see you back here again some time. Things have been a little wonky for us this week, so I recommend also hitting Nanostalgia for some media reviews by a little collaborative team we've got going on over there. Also, feel free to click on the e-mail link if you have any questions. We're here to help. Good to see you. Hope you can stick around.